COSLYS Organic Red Berries Hair and Body Shower Gel cleanses body and hair gently with its soap-free formula. This 2 in 1 natural shower gel is very convenient for weekend trips, holidays and at the swimming-pool. Coslys Organic Shampoo Shower Gel leaves your skin and hair soft with a nice 100% natural fruity fragrance ! Organic red berries cocktail for a good mood boost ! 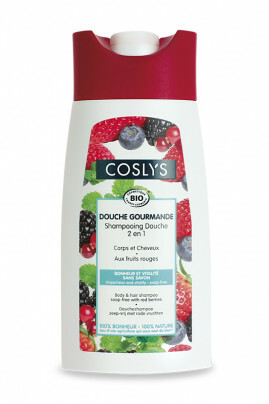 Apply COSLYS Organic Hair Body Shower Gel with Red Berries on wet skin and hair. Lather then rinse with clear water. Aqua (water), spiraea ulmaria flower water* (organic meadowsweet floral water), sodium coco-sulfate (anionic surfactant from coconut), cocamidopropyl betaine (amphoteric surfactant from coconut), decyl glucoside (anionic surfactant from coconut and glucose), glycerin (natural glycerin), ribus idaeus fruit extract* (organic raspberry extract), fragaria vesca extract* (organic strawberry extract), coco glucoside (anionic surfactant from coconut), glyceryl oleate (anionic surfactant from palm-kernel, sunflower oil, glucose and natural glycerin), sodium chloride (salt), coconut alcohol, sodium sulfate (anionic surfactant from coconut), parfum (100% natural origin), tetrasodium glutamate diacetate (antioxydant), glycine soja (non GMO soybean extract), tocopherol (natural vitamin E), citric acid (pH regulator), sodium hydroxide (pH regulator), potassium sorbate, sodium benzoate, dehydroacetic acid, benzyl alcohol (preservative), benzyl salicylate, limonene (ingredients naturally present in essential oils).